Video clip synopsis – Cook’s obsession with discovery continues as he searches for the mythic North West Passage, but is it a journey too far? 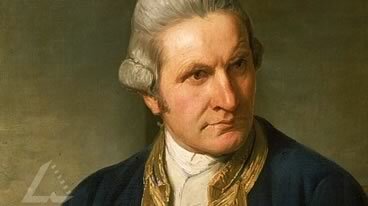 Now retired and promoted to Post Captain, James Cook is bored. He jumps at the chance to take on a third great voyage: to find a fast route to China to secure Britain’s place in the lucrative tea trade. Broadband MP4 cooknthw_bb.mp4 (8.5MB), suitable for iPods and computer downloads. Captain Cook- In Search of the North West Passage is an excerpt from Northwest Passage, the final episode of the 4 x one-hour series Captain Cook – Obsession and Discovery, produced in 2007. In this excerpt Vanessa Collingridge analyses Cook’s personal journeys as well as his geographic ones. She recaps Cook’s achievements in his first two voyages. Cook charted Tahiti and New Zealand and he completed the mapping of Australia in his first voyage as well as adding two new countries to the Empire. During his second, which Collingridge describes as “the greatest voyage of discovery ever made”, Cook went further than any man had gone before, venturing to the Antarctic and then heading north to chart the waters of the Pacific, an area larger than Europe and dispelling for ever the myth of the Great Southern Continent. Now retired and promoted to Post Captain, James Cook is feted and has his portrait painted but the commentators point out he longs to be at sea again. Collingridge presents Cook as a man driven by ambition and not content to be at home without a quest. Cook and his wife Elizabeth have been together for only four of their 16 years of marriage but he is ready to leave his growing family once more. This was Cook’s chance to put his stamp on the northern hemisphere, matching his total command of the south. Success meant a personal fortune and an even greater prize for the former farm boy, a knighthood. The prize has dimmed Cook’s memory of his failing health and fraying temper and he does not consider that this journey will be very hard indeed. How did Cook “shatter the myth of the ‘Great Southern Continent”? Identify the three major voyages of Cook. Add these to a timeline. (You might add them to the timeline you have created in one of the other film clips for this series). Highlight the voyages of Cook on a map, using a tool like Google Maps to draw the route. What does the presenter, Vanessa Collingridge, suggest was one of Cook’s motivations for seeking out the ‘North West Passage’? Why do you think the British Government were keen to sponsor such an expedition? What was the major achievement of Cook during his search for a north west passage? How do the historians depict Cook’s motivations for taking one more voyage? What does the clip suggest about the sacrifices Cook made? Portraiture contributes to our historical and knowledge and understanding. Even today, portraits are commissioned but the role of the portrait in Cook’s time was probably more significant. Why do you think that this may have been the case? Locate a portrait of Cook. How does it depict him? What role do portraits have in an investigation of the past? What types of people are depicted? How are the portraits constructed? What is the main medium used? How does this compare to Cook’s time? Do you think that the purpose of portraiture has changed over time? Why? Why not? What does this clip suggest about the social structure in Britain? Investigate the processes that one had to go through to receive a knighthood. Create a chart that shows the different ranks within Briirtish Society at the time? How were these ranks bestowed?